Quoted without comment, from "The Fortunes of Africa"
So good news if not exactly the biggest news in the world, but is there a policy implication? Yep - the market is proving that right now that there are great substitutes for small gas engine scooters, so ban the sales of new ones. If that's too dirigiste for some, then ban the gas engines that don't pay for an equivalent amount of lifetime operational carbon emissions, or just require a hefty fee of the ones that don't - it'll have the same effect. One might argue the effect, regardless, is zero because the market is probably going to eliminate these scooters within several years. My response is that probably doesn't mean certainly, and cutting off a long tail of dwindling sales is a good thing. Even more important though is the cultural and political precedent showing that gas engine vehicles are on their way out, and we're going to give them an additional push in that direction. While these things barely exist in the US, maybe the mostly-dreaming legislative bills here in California to eventually ban gas-engine cars could take a baby step for now by banning these scooters. Of the two Freds, S. Fred Singer is still with us and selling flim flam. His latest appears in the May 16 Wall Street Journal. It's right out of the Encyclopedia of Scams. Figuring out what the boys from SEPP are selling requires not paying attention to the set-up but watching for where the pea comes out of the shell, so, let's skip down there. 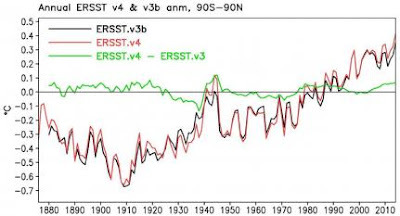 What the sea surface temperature has been doing since 1910 has been increasing with a blip around 1940. Not smoothly, but increasing. Without that blip not 0.5 C btw 1915 and 1945, dates chosen w. care. 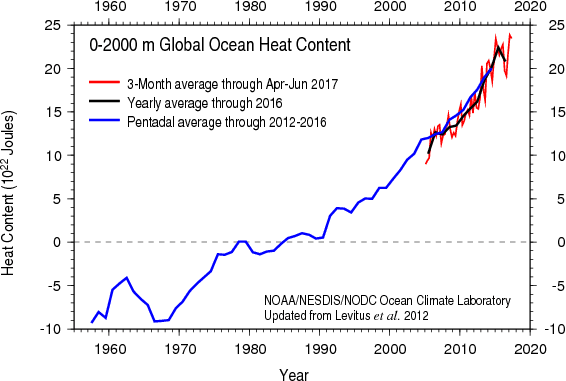 OTOH, watch the pea, what is important for steric sea level rise is the heat content of the oceans, not the sea surface temperature. S. Fred is a sharp one. For this our best data only goes back to 1960 or so, and it really only is good after 1993 or later. However, as Eli will show this is enough. The mass increase component is driven by melt of ice on land which is a function of the temperature at the surface of the ice. We know that the increases in surface temperature have been strongest in the Arctic, but we can also look directly at the decrease in land ice. Satellites are useful. That's been plunging. 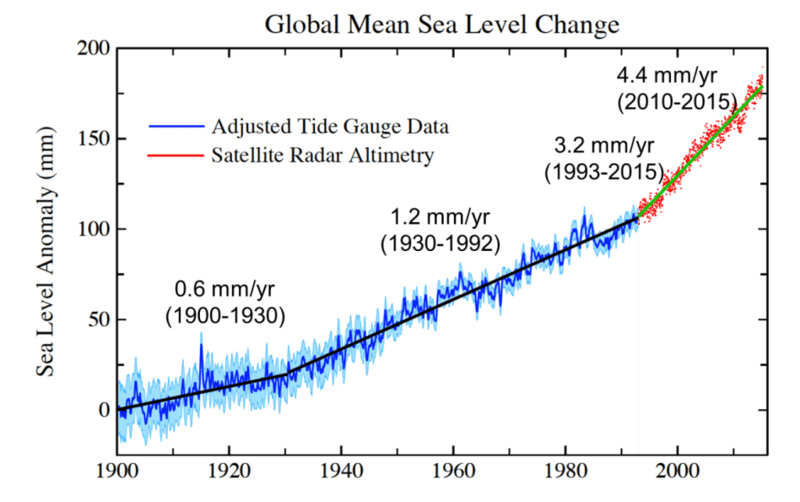 So let's put all this together and look at the increase in global mean sea level. The rise was slower between 1920 and 1990 back in the days when S. Fred was raising big bucks for his retirement fund, but has sped up since. The Turpin and Wahr study shows an increase consistent with the figure to the left. Now some, not Eli to be sure would tell you (Tamino will be coming around in a moment) more about analysis of the time series, but it is more interesting to Eli to note that, hey, we now have the tools to measure sea level rise from space, and also to measure mass gain in the oceans as well as land ice mass loss using the GRACE satellites (well until recently) and the ARGO floats. This provides a neat way of closing the budget on sea level rise, to separate the steric thermal expansion which S. Fred pooh poohs from the mass gain components. You would think some bunny has done this. You would think right. Purkey, S. G., Johnson, G. C., Chambers, D. P. (2014). 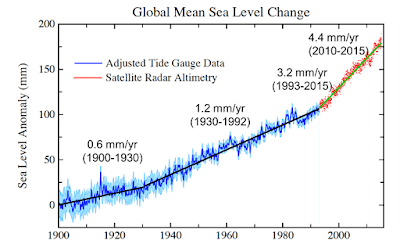 Relative contributions of ocean mass and deep steric changes to sea level rise between 1993 and 2013. Journal of Geophysical Research: Oceans 119, 7509-7522 (2014) and Leuliette, E. W. (2015). The balancing of the sea-level budget. Current Climate Change Reports, 1(3), 185-191. 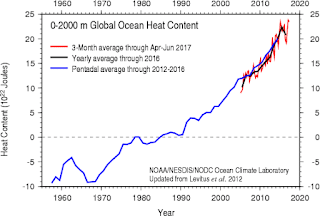 The later has a nice figure showing that the sum of the steric and ocean mass gain match (within reason) the observed increase in global mean sea level. Eli would point the uninterested reader to a figure that Jos Hagalaars put together and the Bunny called "the wheelchair". Eli is a generous beast, OK, S. Fred meant 16000 years ago, and we take his meaning, but the truth is that the Holocene climatic maximum was 12,000 years ago, and the Earth has been slowly cooling from that point (with bumps, especially local ones) until about a century ago when folk started pumping greenhouse gases, esp. CO2 into the atmosphere. Singer is tying to leave the impression that melting started back in the year dot and been continuous and constant since. 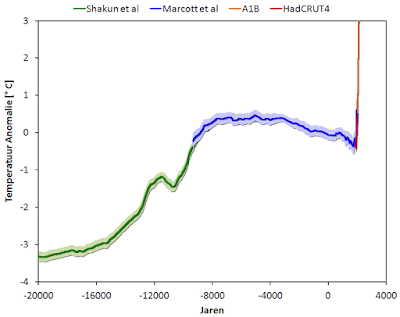 The data and observation show that melting was slowing up until we started using fossil fuels. By ignoring the satellite and float data, he manages to "disappear" the steric component. The cause of the trend is a puzzle. Physics demands that water expand as its temperature increases. But to keep the rate of rise constant, as observed,expansion however evidently must be offset by something else. What could that be? I conclude that it must be ice accumulation, through evaporation of ocean water, and subsequent precipitation turning into ice. Evidence suggests that accumulation of ice on the Antarctic continent has been offsetting the steric effect for at least several centuries. As some players may recall, increasing water vapor feedback, which is Singer's answer to the puzzle, is a base prediction of what most think will happen when CO2 increases in the atmosphere and the sea surface temperature rises. Thank you Fred.